I’m skeptical of the many promises social networks make of how their platforms will transform companies and the world easily. Colleagues and my own experiences in enterprises tell me the exact opposite. Change is very difficult, time-consuming and often the most expensive area of any enterprise software project. That’s the acid test I use when evaluating if a book on social networks is worth reading or not. What Vala and Brad have shown is that when you give employees a voice and platform for communication and collaboration, and show how that senior management supports and values it, cultures can change. Add in accountability and transparency with customers in real time, and the entire ecosystem of a business changes. The urgency to change in the face of global competition can galvanize a company to get real about working together more effectively too. Vala and Brad shown how all these factors combined to create a culture ripe for change, and how they used social business concepts and technologies to unify their company. Enterasys emerged from these challenges stronger, more able to serve their customers and deliver greater value. Senior management must live and model the change they want their companies to have. This resonates throughout the book with example after example of how the CEO of Enterasys, Chris Crowell uses Salesforce Chatter to communicate with every department in the company. He provides recognition for new logo wins, salesperson achievements, welcomes new employees to the company and announces awards the company has won. This creates a culture of high achievement and shows everyone in the company Chatter isn’t a fad, it’s a channel of communication the CEO chooses to use. Credibility happens when senior management lives the change they ask their employees to make. Using Chatter and social networks to unleash creativity and collaboration, not control and command employees. The authors show how senior management at Enterasys are quick to share the good and bad news of what’s going on in the company. This generates trust and keeps the company culture more open and honest. The best-run companies learn to fail fast and keep moving, not freeze up when something goes wrong. Vala and Brad have shown how social technologies can make this happen with much more fluidity, keeping the momentum going on critical projects. Making every role in the company accountable to customer success brings much more meaning to work. Using analytics, Salesforce CRM and Chatter to give every employee a very clear view of how their contributions matter to customers’ success is one of the greatest wins Enterasys has achieved. There’s huge difference in a company culture where everyone anticipates and looks forward to seeing how their contributions made a difference for the customer. It energizes a business and brings meaning to every task. That is the journey Enterasys is on and their lessons learned are valuable. Be bold and amplify the voice of customers in real-time to bring rapid change to your culture. Enterasys did this using a variety of applications including Salesforce CRM, Chatter and their own system, ISAAC. Customers were invited on to Chatter so they could discuss everything from their support and service questions to ideas for new potential products. This broke down barriers between Enterasys and its customers. It also had the galvanizing effect of bringing sales, engineering, senior management and all other departments together to solve customer problems. Collaboration centered on delivering an excellent customer experience. Strengthening service to customers needs to be based on autonomy, mastery and purpose. 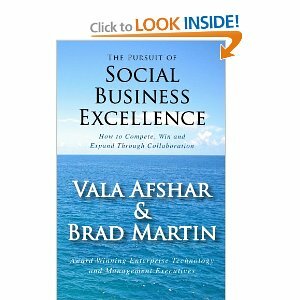 As I read through this book the concepts of Dan Pink’s great book Drive are evident in how Vala, Brad and the senior management team have created a very customer-driven culture. The best companies bring out the best in employees because everyone sees they are making a difference, they are part of a winning organization. Giving employees ample autonomy, a very clear sense of purpose in delighting customers, and mastery of their role in the organization are an unbeatable combination. I think this is why Enterasys is so successful, they have used social networks only when they will accelerate these factors of long-term motivation. Strengthening service to customers starts with a clear definition of what success looks like. When an entire company can agree and share in real-time what measures of performance matter the most in serving customers, change happens fast. Bringing employees into defining just what those measures are is not only good leadership, it’s critical for change to happen. The services and support teams were asked to define what makes a Hall of Fame Services and Support employee. Enterasys senior management included these benchmarks and started measuring the department’s performance against the team’s own benchmarks. The result were impressive: 70% of all support issues are closed on first contact, there was a 19% increase in first-contact closure rates. As the adoption of social collaboration applications increased by 13% call abandon rates dropped 20%. Solid evidence that when employees have strong autonomy and purpose in their jobs, customers get the best a company has to offer. Bottom line: Get beyond Kumbaya and onto the task of using these technologies to bring autonomy, mastery and purpose into your business. Enterasys shows how this can be done in a highly competitive industry with impressive results. Global Business Pages is a directory that is designed for your business to stand out and to which your prospects will relate. with millions of businesses listed since its launch in April 18th, 2002 it is designed to reach more Local, National and International customers for your business. Global Business Pages which has celebrated its 11th year of existence has enabled many new, small, medium and large businesses to reach more markets. “We want Global Business Pages to be a sustainable opportunity for producers and sellers in the world’s poorest nations; a way to introduce their skills, talents, goods and services to every buyer and seller on earth,” said the Publisher Vincent Theophil.